Oh Spring? Bring it on! We've spent the last few days whipping up our spring offerings. Normally, we'd wait a few more weeks, but the wholesale customers with my sister's soap company have been shopping up a storm! It seems like we've been making soap constantly, but the shelves don't show it. 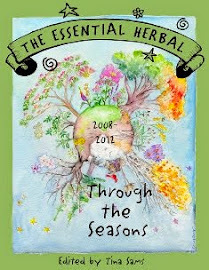 They are available for retail sale on The Essential Herbal website, too. Since yesterday, we made a gorgeous batch of Happy Wanderer soap, made with jewelweed and plantain, and a little lavender and tea tree essential oil. In the summer, we gathered lots of extra jewelweed and plantain, and processed it so that it would be ready in the early spring. We made rows of bottles of Git Spritz and several dozen Git Sticks. The Hiker's Releaf Spray is all ready to go, too. In between, we made a batch of Ocean Salt Spa Bars, some Granny's Lye Soap, Apple Snap, Gardener's (with cornmeal, comfrey and tea tree oil), Apricot Freesia, Honey 'n Oats, Grapefruit Lily, Rosemary, Ginger, Lilac, and 4 half batches of test fragrances - all of which we love! We still have some things to catch up on. Boo-Boo Balm is low, as are the Amber lotion bars and the Arnica Rub sticks. Oh and lip balms. And the Oats 'n Flowers facials... But a few days of determined work, and we'll be up to snuff. AND we've started some earnest work on the next book from TEH - By the Hearth. 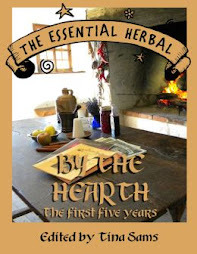 By the Hearth will be a compilation of the Fall and Winter issues from the first five year, and be a companion to Under the Sun, which covers Spring and Summer from the same time period. There are a few other projects waiting to unfold, but for now just packing and shipping the orders as they come in is filling in all the gaps. There is barely a wisp of color outside. The occasional streak of red as a cardinal perches forlornly on the nearby fir tree is shocking in contrast to the varying shades of gray. Last year at this time I was peeking under leaves and walking along the creek, thrilled with the occasional patch of green from chickweed or garlic mustard, thinking ahead to the jewel-toned woodland wildflowers that would be like a siren call into the woods in another month or so. All of that is so deeply covered with snow that the only hint of spring I've seen lately was when I dug a path to the fuel tank, and found some grass under the drifts. Some of the gathering baskets are hanging by the backdoor, ready to go. My fingers are itching to touch dirt. My heart is aching to see a sign of the spring to come. 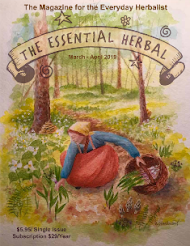 The seed and plant catalogs that I've gone over with a fine-toothed comb are feeling a bit like mockery, and even the current issue of The Essential Herbal is brimming with early spring hopefulness. So today, I decided to go for a little nature walk here inside the house. It is a rare day outside when I don't find something that needs to come back into the house. I thought I'd share it with you, just in case you're feeling it too. Inside the front door is a table where little things get dropped. Nuts, feathers, stones, and whatever is in my pockets. Off to the side is a barely visible brass "lucky" frog statue, sitting on Chinese coins. I help him along sometimes with gemstones, feathers, and loose change. I think some dusting is in order. The corner cabinet in the living room is another repository for found natural objects. There is a big cylindrical jar filled with shells and sea glass, a gourd stuffed with lunaria, dried daffodils, and feathers, and some twisted vine that caught my eye one day - among other things. This little curio cabinet is a little harder to see, because the back of it is mirrored. It is filled with sprigs of dried flowers, seed pods, a really beautiful egg-shaped beeswax candle, gemstones, and at the very bottom there is a very old set of metal beads that I found walking along some railroad tracks one day. Where I used to work, the tracks ran along the building, which were very close to what was once the town dump site. My favorite lunchhour activity - especially in the spring when the thawing seemed to rearrange the earth - was to walk along and find old bottles and various other oddities from a long time ago. This basket contains roses that arrived for my birthday. They were beautiful, but their arrival coincided with what was to become our 22 day sojourn of hospitals and hospice, ending with our brother John's passing. Somewhere in there, I snipped them off and put them in the basket to dry so that I could enjoy them later. A little packet of blue squill bulbs that I *should* have planted in the fall got in there somehow, too. Several years ago I visited my friend Sharon Magee's house, and was awed by her collection of old herbal remedy containers. It gave me a new eye for when I visit flea markets and such, and now I love my own tiny collection. It's exciting to find the old packages, and read the labels - things have really changed! Eventually today, after getting through piles of left-for-later emails and business stuff, I think I'll strain off the fruited brandies and vodkas that were started in the full days of summer, and turn them into cordials. That will help. The next issue is in the mail, and it is filled with wonderful stuff! So many great ideas to help us all start thinking ahead to the sunny, windblown days of spring! Recipes, instructions and tons of cool information for herbies to revel in! 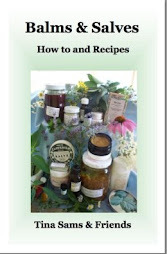 Complete instructions and recipes to make Calendula or Lavender Hand Lotion for use at home. Perfect for this dry time of year! Crystal Elixirs and their history are explained. Some gems and their purposes are discussed, and you’ll never think of those rings you’re wearing the same way. Kristena shares some simple ways to clean the house without the harsh detergents and chemicals that we’ve come to know. Pat and Michele are bringing some new ideas for marketing their farm and plants, explaining Herbal CSA’s and drop shipping, new ventures for them in 2010. Learn which herbs and essential oils can help you keep strong bones. Off we go to New Zealand, to learn some of the traditional healing of the Maori people. Yummy, nutritious beverages that you can whip up at home, filled with good, greens and anti-oxidants to take you through the day. This series was originally written by Bertha Reppert, and Susanna will be sending a taste of each. 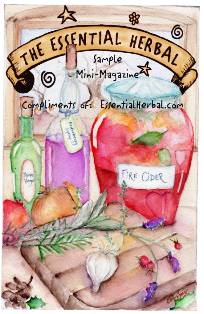 Zesty Aries Mustard and several herbs for this fire sign are included in this installment. Using and growing lemon verbena – one of our favorite herbs. The how and why of making a Stinging Nettle Infusion, the perfect intro to spring for our bodies! A humorous and oh-so-true collection of garden wisdom, written as only someone who has truly experienced it could tell it. Pat tells us about the gardening practices in Shaker gardens. Harvesting and nutrition information on several delicious weeds, along with ideas on how to prepare and eat them. SouthRidge Treasures, Everlasting Flowers, Mary Ellen WilcoxGrow some everlastings this summer! Mary Ellen discusses how to grow and dry these beauties. Comprehensive discussion of how to grow plants from seed, and how to avoid some of the pitfalls. A walk down memory lane of childhood. Maryanne and I dedicate this issue to our brother John Snyder, who created the cover illustration as his final creative work. The bananas on the counter took a turn for the worse a couple of days ago, along with a golden delicious apple that had taken on a rather wrinkled appearance, so while the boys were plowing and shoveling out front yesterday, I thought I'd make them a treat. I mashed up two of the bananas, and processed the apple with a handful of walnuts and a few slices of crystallized ginger, then loosely followed the recipe for Banana Nut Bread from the Better Homes and Garden New Cook Book. It all went into a greased loaf pan, and baked at 350 degrees for about an hour. It could have used a few more minutes, because the center was a little too moist. It was delicious. A great way to use up some of the fruit that was taunting me. And just because it is so amazing, here's another view of the backyard - with sun added, making it appear less ominous. Note the railing just in front of the trees in the center of the picture. That is a split-rail fence, nearly 4 feet high. Sometimes, I'm just a warning for others. Yesterday started out as another peaceful, snowbound day. We were well in to 3 feet of pristine snow, with more falling, and winds picking up that would whip it into drifts taller than I am. Provisions were holding up well, power on... a good day to get things done, or read a book, or whatever crossed my mind. Unfortunately, what crossed my mind was a warning that our local tv station has been talking about for a week now. Newer houses are often built with J-shaped furnace exhaust pipes going out the wall behind the unit. They talked about how snow can block the pipes, shutting down the furnaces - or worse, causing a build up of carbon monoxide. I'd checked it before yesterday's storm, but the howling winds and immense snowfall had me concerned. There is no window or door on that side of the house that would allow me to look. Eventually, I remembered that the downstairs door to the daylight basement was only 8 or 10 feet from the pipe. It's a door I've rarely used, and for the past 2 years was the door to my brother's apartment - so again, I haven't used it in a great while. This was great! It would take only a minute to check it, and then go about my day with my mind set at ease. I slipped on a tshirt and jeans, reconsidered and grabbed some socks before sliding on some loafers, and threw on a jacket. Yanking the shovel from the drift on the front porch, I was soon to be free from the nagging worry. Out I went, pulling the door shut behind me, into the roaring wind and biting white-out. Digging along, within minutes I could see that the pipe was a good foot above the snow. Eureka! my head! 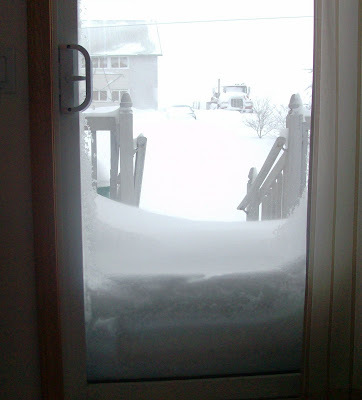 The only way up to the door was way out around the snow drifts, shoveling as I went. Alas, that door was locked too. From my house to my sister's house is only about 2 city blocks. It is downhill. It was my only real choice, other than breaking a window - which in retrospect doesn't seem like such a bad idea. The roadway was too dangerous, only as wide as a snowplow, with 6 foot sheer sides and maniac snowmobilers careening around on them. Across the fields seemed like a better choice. I abandoned the shovel on the porch and set out. Nothing had been touched since the last storm, so there was at least three feet of snow, and lots of blowing, drifting snow. It was up to my waist. Each step took considerable arm waving while I pulled my legs up as high as I could to lessen the drag of the snow. Less than halfway down, I was falling and hyperventilating from fear and effort. Each time I fell, it was harder to get up with nothing to grab, my feet far ahead of my center of gravity. Nobody knew where I was, and I was keenly aware of the fact that stopping to rest could easily result in death. Occasionally, a tree acted as a lever to propel me forward, but the space between the Christmas trees was even deeper, holding the snow that had fallen from the branches. The three or five minute walk that I take many times a week turned into a half hour of sheer terror. Slogging through snow that is deeper than the height of your legs is really hard work. I got to the shop, which is approximately 50 yards from the house, and couldn't have been more grateful to turn the doorknob, throwing myself into the warm, dry workshop. From the shop, I called my sister's cell phone and sobbed into the phone that I was there. Her husband trudged out and I followed his steps back to the house. It took hours for my knees to stop shaking, and to stop coughing from the workout my lungs had gotten. Just around nightfall, they got their driveway plowed and I got to come home. Even if you are just stepping outside for a moment, take your keys. Wear a hat and gloves. Be prepared for anything, because in this kind of weather, the smallest mistake can turn deadly. Although a cell phone wouldn't have helped too much (except it would have alerted someone as to my location), slip that into your pocket too. Nothing says, "pause and reflect" like 20 or more inches of fresh snow. Every door of the house is blocked by snow, and I'm in no rush to change that. January slipped past us going 100 mph. The last day that was normal was the 10th - and then we took off on a bizarre roller-coaster of a family crisis. How very appropriate that Mother Nature would supply me with this opportunity to stop, recharge, and search for a new normal. There have been a few times when huge snowfalls have blessed me in this same way. Once, there was a painful holiday season when snow took away any decisions, leaving me and Molly to sip cocoa and watch old movies together. Enough snow takes away our feelings of "should". This is definitely such a snowfall. The magazines were wafer-sealed yesterday, awaiting address labels that I'll get to on Monday for an early morning Tuesday mailing. Piles of laundry from the aforementioned January are folded and put away. Larders were well stocked before the storm, and as long as the cat doesn't go on an eating binge, we're all set. I dug out a tablecloth that my mother and I started embroidering in the late 70's, and started work on it again. It may get done in this new decade (and millenium!). Light reading - The Darwin Awards in paperback. Heh. The thick soft blanket of snow has tucked me in. I am grateful.